Are you preparing to launch your first Inbound Marketing Campaign? Play it safe, and download this checklist of tasks to follow to make sure you've got all of your ducks in a row. This resource can be used again and again, and shared with anyone on your team involved in the process of developing your inbound marketing campaigns. 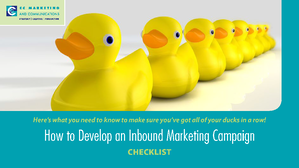 Download How to Develop an Inbound Marketing Campaign today!